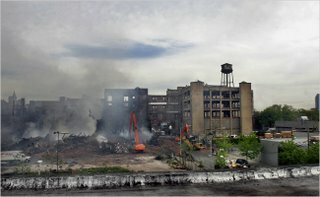 New York City's largest fire in over a decade has been burning for the past 3 days over blocks worth of abandoned warehouses in Greenpoint, Brooklyn. Hundreds of firefighters have been battling the blaze, which has been labeled suspicious because of accelerant found in five different spots around the building. The owner of the site is a real estate developer whose plan to build waterfront condos has stalled because of historical preservationists who are trying to get the century-old warehouses declared landmarks, which would mean that they couldn't be taken down. Well, so much for that. Seems like those condos will be going up after all. Surprise, surprise. 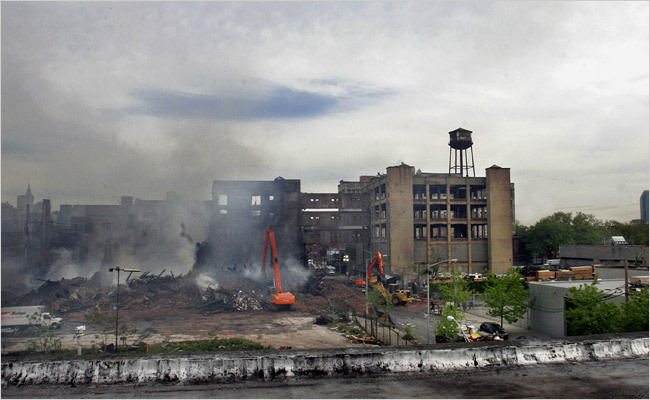 I don't buy the "industrial history" argument, but the borough of Brooklyn is undergoing a massive change that mirrors what will happen at the site of the fire. One and two family homes and small businesses are being replaced by towering condo developments that developers are rushing to get built ahead of a proposed zoning law change by the city. Drive down the 6-mile span of Ocean Avenue, for example, and you'll see at least ten active construction sites all building the same thing---condo developments that look almost identical. Emmons Avenue in Sheepshead Bay, which used to be dotted with seafood restaurants is now the home to and endless sea of completed and semi-completed condos, one taller than the next. Brooklyn is still the most unique of the boroughs, but you can't help but feel that some of that character is being drowned. On the Greenpoint waterfront, it will be more of the same. It doesn't take a pyrotechnics engineer to figure out what happened there.